Audio Description: Mayor Bill de Blasio & Speaker Mark-Viverito’s Message on the NYC Identification Card. Various New Yorkers share how they use their IDNYC cards to access school buildings, museum memberships, and discounted movie tickets. 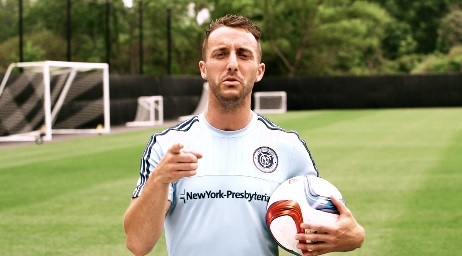 Audio Description: The New York City Football Club team practices their movies and talk about the benefits of having an IDNYC card. Spanish speaker 1: It’s my go to ID when I go to the bank, and use it to get free memberships at the museums! Spanish speaker 2: I “scored” my card in no time. It was quick and easy. Free memberships at 33 museums, zoos, concert halls and gardens.